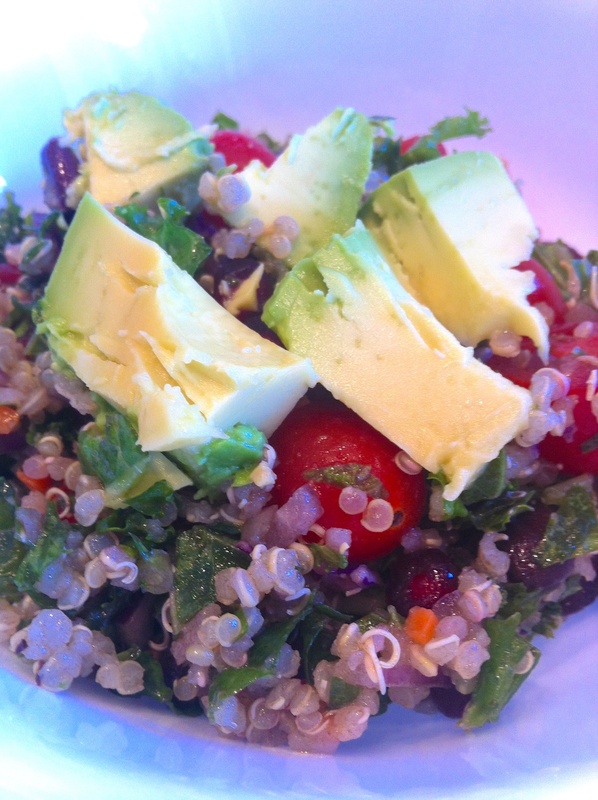 Quinoa… I’ve underestimated your amazingness. As part of my goals for 2013 which include, cooking healthier and more whole foods, hosting more dinner parties and teaching my dog how to do the dishes- quinoa is one of my new favorite ingredients for just about everything I’ve been cooking lately. I love how easy it is to make and keep on hand so you can throw together a quick salad for lunch or add it to chili (like the black bean, sweet potato & quinoa chili I posted earlier). The longer you let this salad marinate in the dressing the better it is. I made this the night before and it made the perfect lunch topped with avocado! Cook quinoa according to package directions and allow it to cool, this can be done a day ahead and kept in the fridge if desired. 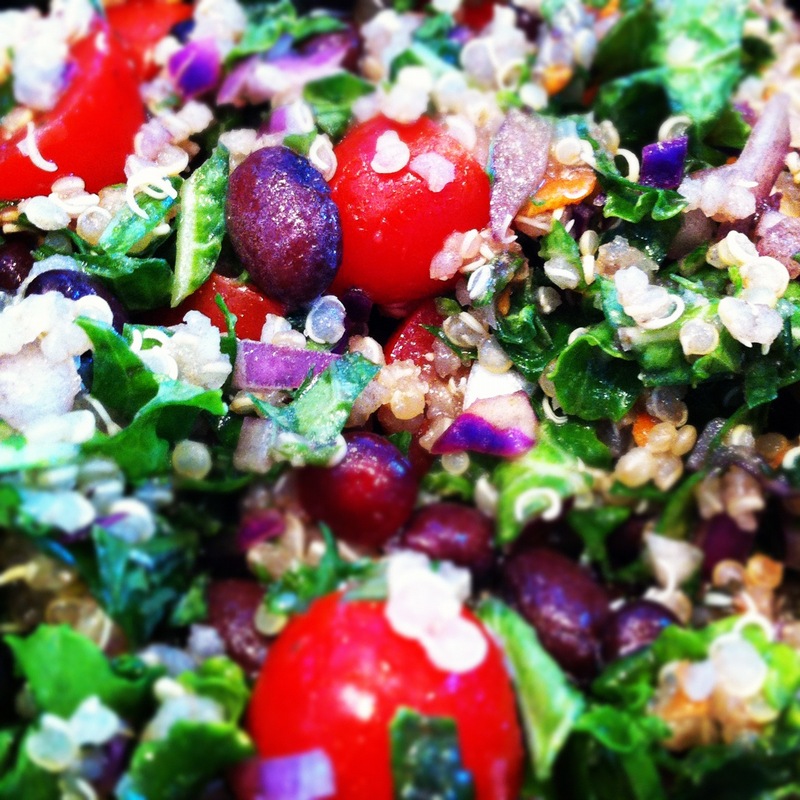 Chop kale and combine in a bowl with cherry tomatoes, onion, black beans, quinoa and pomegranate seeds. In a separate bowl combine all vinaigrette ingredients and whisk together. 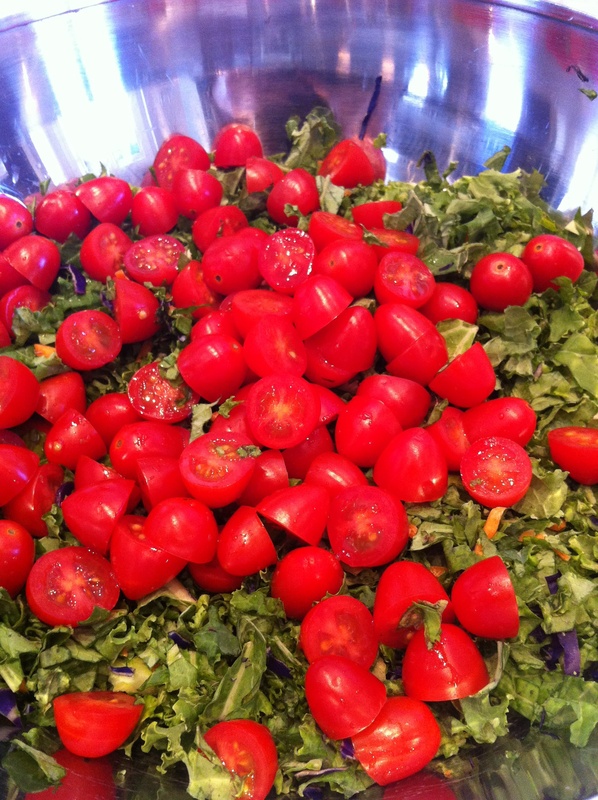 Pour vinaigrette over kale salad and toss making sure to coat all ingredients with the dressing. Cover and place in the fridge for at least an hour or over night if possible. Serve salad with sliced avocado on top and ENJOY! This entry was posted in Entrees, Recipes, Sides and tagged black beans, Kale, lemon vinaigrette, quinoa by skibootsinthekitchen. Bookmark the permalink. Made this last night at sister Calli’s recommendation. Delish! Great blog Perry!